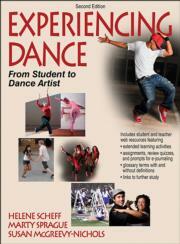 Welcome to the teacher resources website for Experiencing Dance, Second Edition. State adoption reviewers: Sign in, then select “Reviewer Instructions” at left for information regarding access to sample materials. School and district reviewers: Teacher resources are free to course adopters and access is granted by your Human Kinetics K-12 sales manager. Contact a sales manager to request access. Each chapter features at least one video clip to supplement the text. Some clips are examples of real-world dance classes in various dance styles and genres; others show techniques or illustrate activities presented in the book.